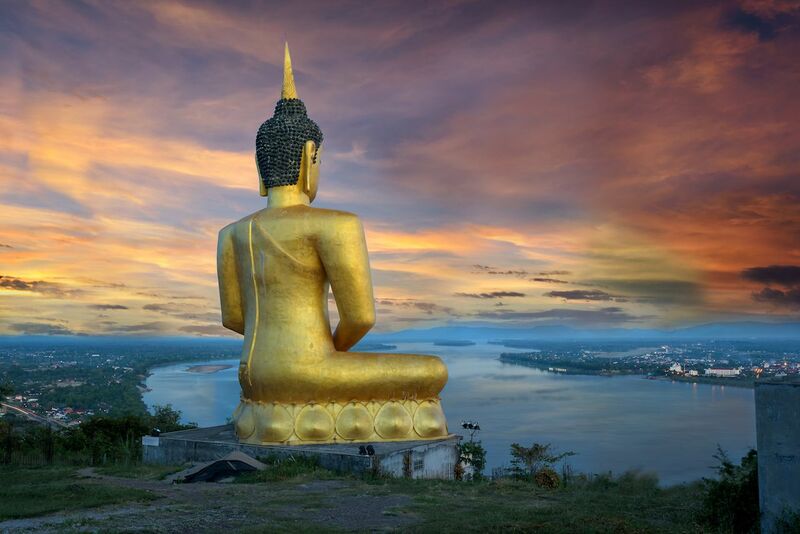 Hundreds of millions of people practice Buddhism worldwide, so it comes as little surprise that some of the largest and most impressive testaments to any faith are various Buddha statues found throughout Asia, where the largest concentrations of Buddhists live. From elaborate rock reliefs to brightly painted sculptures, these 11 effigies will leave you absolutely awestruck. A highlight of the UNESCO-recognized Mount Emei Scenic Area, this 233-foot-tall statue is the largest stone Buddha in the world. The creation was carved into a sandstone cliff during the Tang Dynasty around 800 AD. It depicts a Maitreya, an iteration of Buddha that is believed to be yet to come. 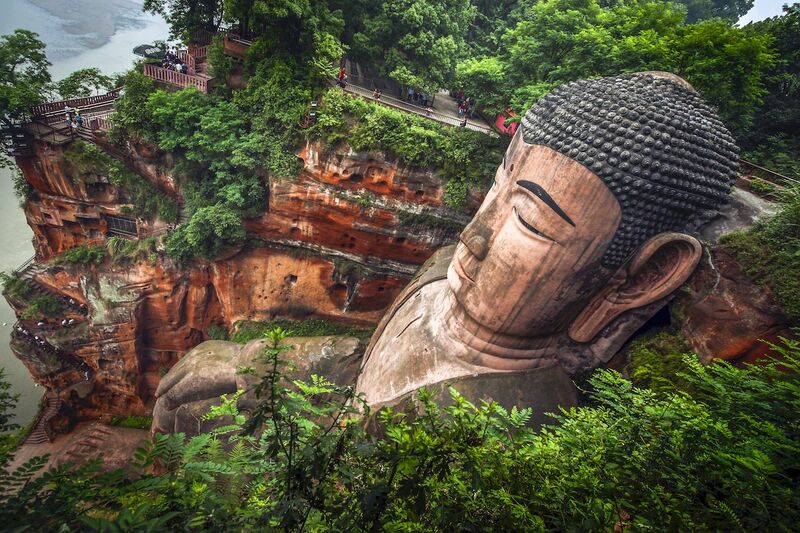 Despite suffering some weathering over the years, the massive carving is one of the grandest Buddhas ever sculpted and a must-see in the Sichuan province of China. Construction on this bronze Buddha overlooking Lantau Island began in 1990, making it one of the newer statues on this list. Nonetheless, weighing in at more than 250 metric tons, the Tian Tan Buddha is an important example of a seated Buddha statue. 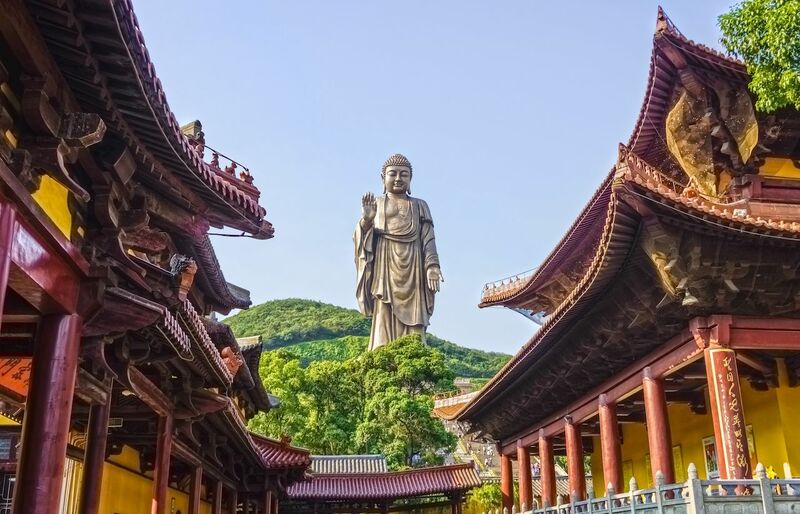 It sits on a lotus flower and stands guard over the nearby Po Lin Monastery, a hallowed site for Buddhist pilgrims and popular tourist attraction. If you get the chance to visit, be sure to follow the 250 steps to the base of the statue for an up-close and personal look. Wat Pho is an ancient temple complex in Bangkok. Although the site is filled to the brim with more than 1,000 Buddha images, the most impressive tribute to Siddhārtha Gautama, the founder of Buddhism, is the golden reclining Buddha that stretches 150 feet across the hall in which it’s housed. Ornamental details include mother of pearl inlays on the bottom of the Buddha’s feet and glass mosaic designs surrounding its head. 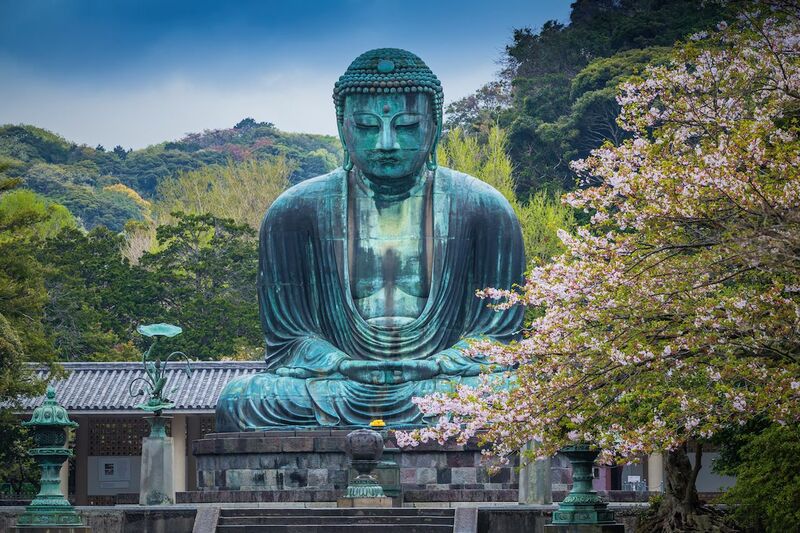 Found at the Kōtoku-in temple about an hour south of Tokyo by car, this great bronze Buddha is an important feature of the Japanese cultural landscape and a proposed UNESCO World Heritage site. Completed in 1252, the statue weighs just under 100 tons, lighter than one might expect given its 43-foot height. This is because the statue is hollow, allowing visitors the chance to explore the interior of Japan’s second-largest Buddha for a nominal fee. One of the top attractions in the Bhutanese capital, this massive gold and bronze statue towers more than 164 feet over the Kuensel Phodrang Nature Park atop a meditation center. 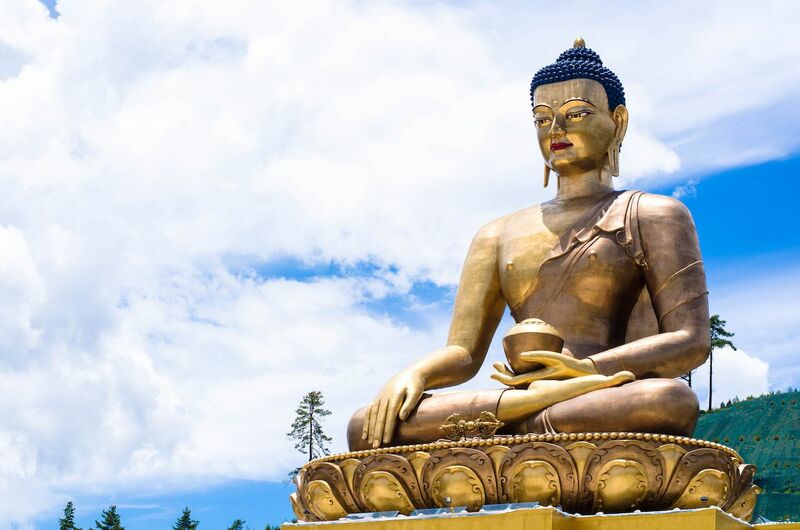 The big Shakyamuni Buddha — another name for Gautama Buddha — was twice prophesied to bring peace and good fortune, first by yogi Sonam Zangpo and later by Guru Padmasambhava. Inside the meditation hall, more than 100,000 smaller gold and bronze Buddhas further honor the deity. 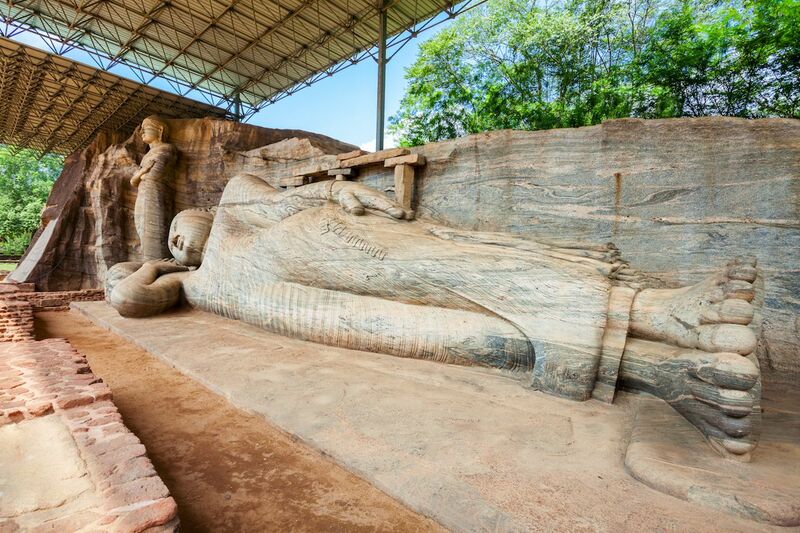 There are several Buddha statues at the Gal Vihara temple complex in Sri Lanka, but the site is best known for housing a 46-foot-long, rock-cut reclining Buddha, one of the longest in South Asia. Lotus flowers decorate the statue’s right hand and feet, symbolizing purity, and its pose, called parinirvana, represents Buddha post-enlightenment. Perhaps the most striking feature of the carving is the marbling present in the granite, which together with its impressive detailing makes this relief an icon of the Sinhalese craftsmanship found in Sri Lanka. Standing tall at around 290 feet and weighing 700 tons, this big bronze Buddha certainly lives up to its name. It was completed in the 1990s and smiles down at visitors to the Mount Lingshan Scenic Area. 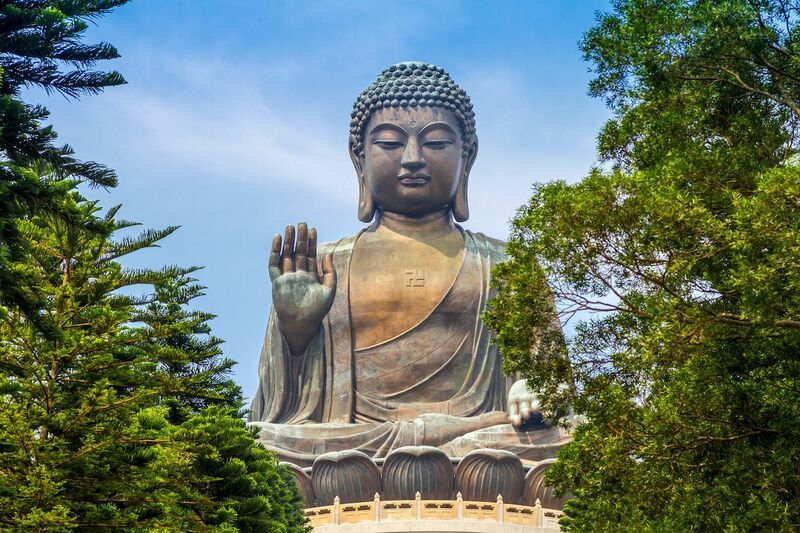 The Buddha’s right hand is raised with its palm facing outward, making the abhaya gesture, a sign of fearlessness. Roughly an hour and a half outside of Shanghai, the Mount Lingshan Scenic Area is popular with tourists, who enjoy taking the 216-step staircase to the base of the statue. Buddhism is the most common religion in Laos, so it makes sense that the Southeast Asian nation houses an impressive tribute to Buddha himself. Erected on a hilltop overlooking the Mekong River at the Wat Phou Salao temple site, this large statue was completed in 2013, as is evidenced by its untarnished golden sheen. It’s a bit of a trek to reach — there’s a staircase leading up the hillside, as well as a steep back road — but it’s worth the effort to see up close. Reaching heights of 394 feet, this Buddha statue is one of the tallest in the world. The bronze, open-palmed Buddha is seen standing on a lotus flower, which adds about 33 feet to its already impressive height, and visitors can take an elevator up 289 feet to take in the surroundings from an observation floor. 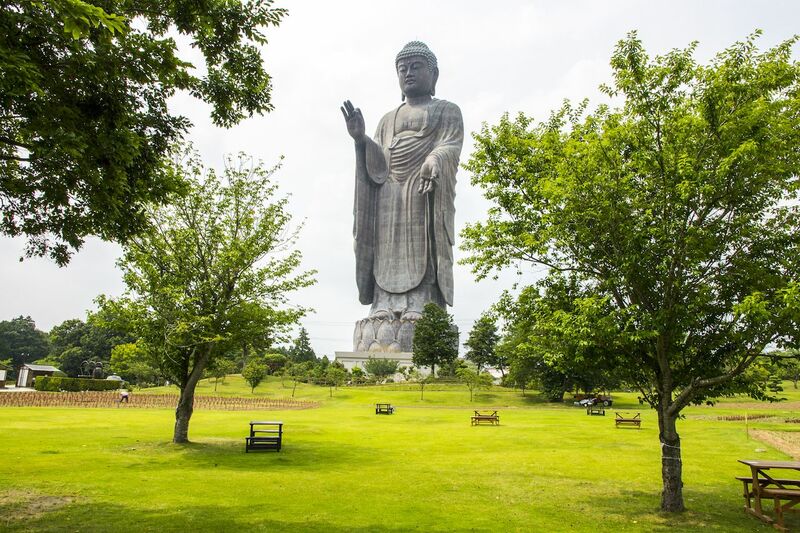 Built to honor Shinran, the Japanese Buddhist monk responsible for establishing the Jodo Shinshu sect of Buddhism, the statue is located just over an hour outside of Tokyo by car, making it a perfect day trip from the Japanese capital. Admirers of grand Buddha sculptures get not one but two beautiful displays at the Maha Bodhi Tahtaung monastery in Myanmar. 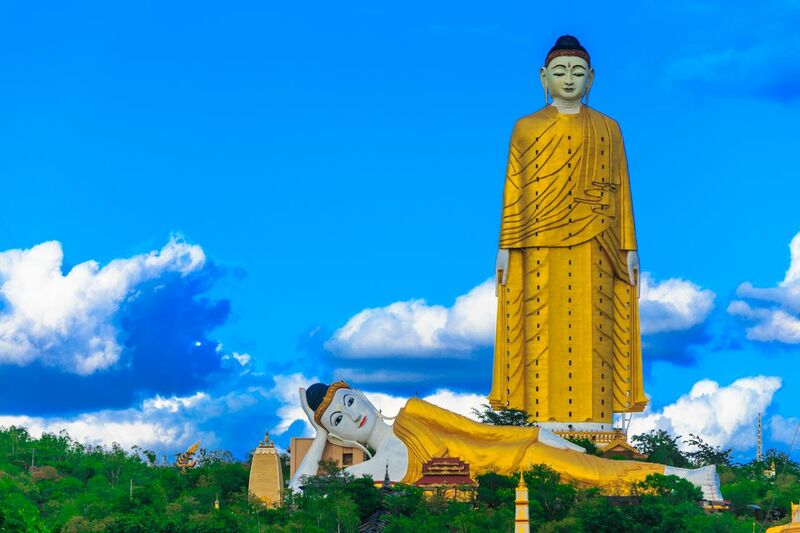 The first thing you see when you approach is a 423-foot-tall standing Buddha, which towers over a second image of a reclining Buddha. 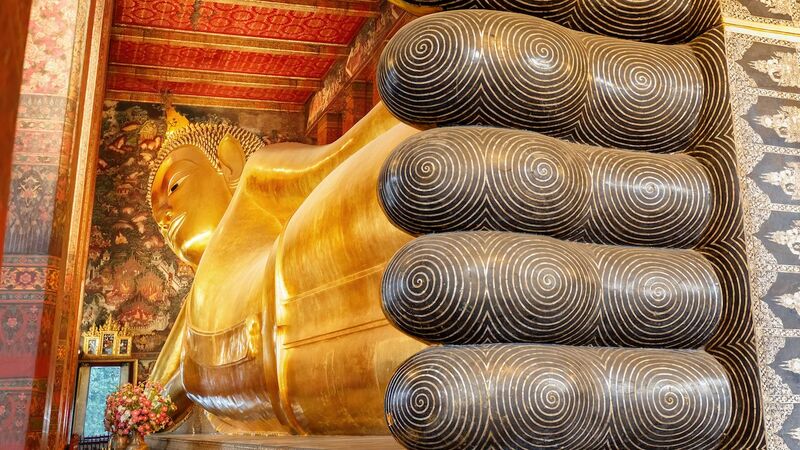 The statues were built just a few years apart: the reclining Buddha was built first in 1991 and the other in 1995. While both are impressive, the upright Laykyun Sekkya image blows visitors away not only with its glittering facade but also its interior, which is split into 31 floors representing the Buddhist lifecycle. Each floor is decorated with murals on theme with the different stages of life. Neither the tallest nor most opulent Buddha in the world, this sandstone relic is nonetheless one of the coolest you’ll ever see. It once belonged to a 14th-century temple called Wat Mahathat in Ayutthaya, a UNESCO World Heritage Centre, though the temple is now in ruins. Today, the statue can be found peeking out from the trunk of a Bodhi tree, a symbol of enlightenment in Buddhism. 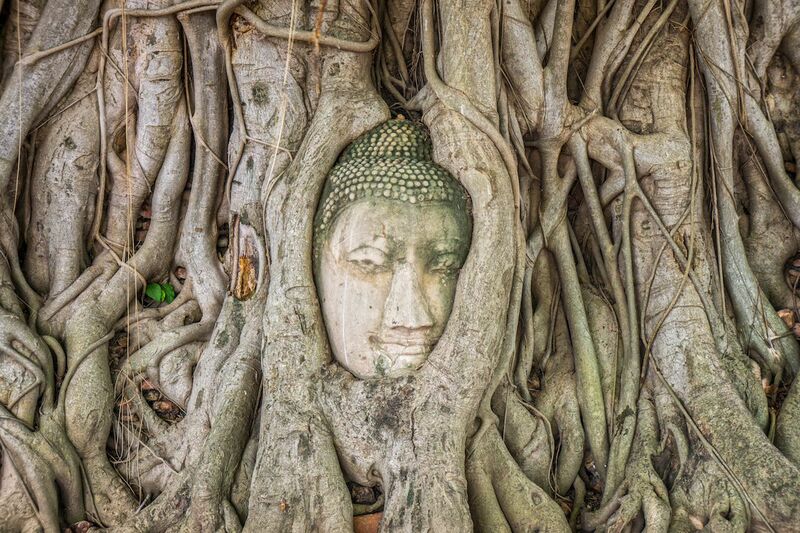 Over the course of 250 years, the tree’s roots have grown around the sandstone bust, making this Buddha an important part of the Thai landscape in more ways than one.